The SAPPHIRE FLEX R5 230 now has the latest DDR3 memory clocked at 1600MHz effective, and runs with a core clock speed of 625 MHz. The FleX model adds the SAPPHIRE exclusive ability to support three DVI monitors in Eyefinity mode without the need for any active adapters and deliver a true SLS (Single Large Surface) work area. The first two monitors are connected to the two DVI outputs. 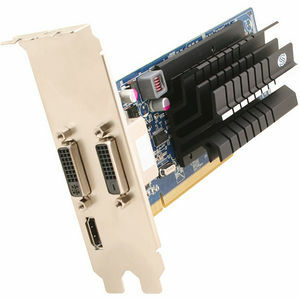 A third DVI monitor can be connected to the HDMI output with the passive cable adapter supplied.